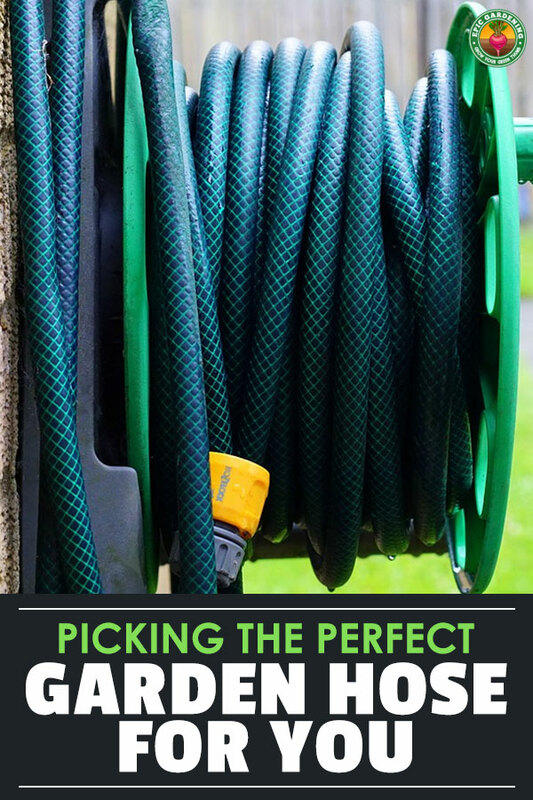 With such a wide array of options to choose from, and only small differences in how they look, it’s tempting to just purchase the cheapest garden hose you can find. However, garden hoses have many small differences that have a huge impact on how easy the hose will be to use and how long it is going to last. 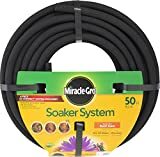 The best garden hoses on the market will last for five to 10 years. Unfortunately, most people who purchase lower quality hoses wind up replacing it every year because of rot, cracks or leaks. While there are some issues that you can repair, it makes more sense to purchase a quality garden hose to begin with. If you’ve already invested in the best hose reels and nozzles, it makes sense to invest in a quality hose as well, doesn’t it!? 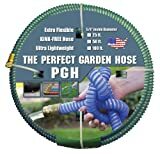 This guide will go over the best garden hose based on what you want it to do and how you will use it. Let’s get into it! There are several factors you need to consider when buying a garden hose. Ideally, you’ll buy one hose and it’ll last you almost a decade. That makes it important to consider all of the factors when making your purchase. Longer isn’t always better. As a result, you need to consider how long of a hose you really need. If you purchase one that is too long, it will be heavy and difficult to store. Most gardeners can get away with a 50′ to 75′ hose. If you need to go above that, it’s sometimes better to get two 50′ hoses and couple them together instead of buying a larger 100′ hose. The most common diameters are 5/8″, 3/4″ and 1/2″. This measurement refers to the width of the interior of the hose, rather than the outside. Vinyl – This is usually reinforced with a type of radical cord and is the most inexpensive option, but it’s not as durable as other materials. Rubber – Rubber hoses are the best material overall. They can carry hot water and resist ozone deterioration and cracking, but are heavy and more expensive. Reinforced – These hoses are usually reinforced with some type of mesh lining and can resist to splitting and kinking. They can also withstand higher levels of water pressure. The strength of a garden hose is measured in regard to “burst pressure.” If you are going to be using a sprinkler or nozzle. find a hose that has a rating of over 350 psi to avoid bursting your hose. It is important to purchase a garden hose that is flexible, which will ensure it can easily go around corners and be stored more easily. The end pieces on a hose are the couplings. While many hoses come with plastic, these will break more easily. As a result, you need to choose hoses with metal couplings, ideally brass if possible. When you begin searching for a garden hose, you are going to find there are several types to choose from. Learning a bit more about each option can help you determine what you need. A lightweight or light duty hose is typically made from vinyl. The best lightweight garden hoses are going to be reinforced with multiple piles (layers) or reinforcing mesh, which will help prevent kinks. They usually have plastic fittings and are offered in thinner diameters. However, the upside is the price. They are much more affordable than other garden hose options. 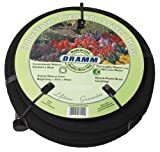 If you are trying to garden on a budget, don’t plan on using the garden hose often or don’t need an extremely long hose (these are typically 50 feet long, or less), have lower water pressure or don’t plan on using a hose nozzle or sprinkler, then the lightweight garden hose is a great option. 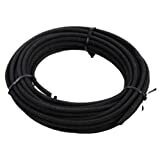 This is an extremely tough, rubber hose that can stand up to any elements in your yard or garden. 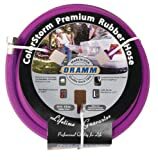 One of the most appealing factors that set this hose apart from other in its class is that you can find it available for sale in six different colors. Designed to last, this hose features nickel-plated brass couplings, along with a thick rubber body. It will remain flexible, even when temperatures drop outside. You can use this hose with hot water up to 200 degrees Fahrenheit, without worry of damage and it is made in the USA. This hose is lead-free and safe for drinking. It is made with heavy-duty aluminum couplings and offers reinforcement at the end that attaches to the spigot. 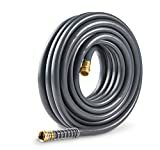 A unique feature is that this hose offers a 500 psi burst strength, which is higher than other options on the market today. Thanks to “lay-flat” technology, this hose is kink resistant. According to a statement released by the manufacturer, this hose is guaranteed not to kink. It features a coiled collar at the end that attaches to the spigot, along with lead-free aluminum couplings. It is designed to prevent the development of mildew and mold and has anti-microbial features. This hose is made in the USA and remains flexible to 45 degrees. One of the most unique features of the Tuff-Guard hose is it superior exterior flexibility, which is provided by the polypropylene double helix coil. While the hose is flexible, it is also designed to resist kinks providing you with a smooth watering experience. Other features include machined brass couplings and a 300 psi burst pressure. When you purchase this garden hose, you also receive a lifetime replacement guarantee. It will remain flexible, regardless of the temperature (even when it drops below freezing). The hose also comes with a brass collar and couplings, as well as a burst strength rating of 500 psi. The flat garden hose is extremely similar to a fireman’s hose. This type of hose is round when it is full of water, but will flatten down when the water is gone. They are usually lightweight and easy to roll up. These hoses are self-draining and take up much less storage space than conventional hoses; however, they may be somewhat challenging to store if you don’t use a hose reel. 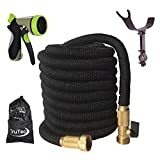 There are some flat hoses that are sold with a hose reel, but if they aren’t you can check to see if they will fit with one you already have or one you can purchase separately. Since the best flat garden hoses are extremely flexible, you will discover they offer a number of things you should be aware of. 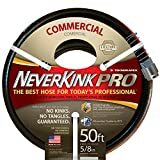 They are usually made out of vinyl, which means this type of hose will kink and puncture much more easily than other types and they have a lower pressure rating. If you are pulling the hose around a corner, you may find unrepairable damage occurs. Additionally, you have to have the entire hose unrolled before you turn on the water, which can be cumbersome in some situations. It is best to use flat garden hoses when storage space is a problem, and the hose is going to be stretched in a straight line over a surface where they aren’t many things that could snag it. In most cases, these are not the best option if you are going to be using them frequently. Chances are you have seen an ad on television that features scrunchie hoses that will expand up to three times their length when they are filled up with water. These are typically extremely lightweight, weighing about a pound, and offered in bright, fun colors. They have a small diameter and provide adequate water flow compared to traditional garden hoses. While they will expand as the packaging claims, as time passes, these hoses often stop contracting fully. 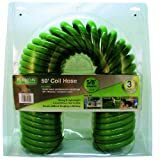 This leaves you with a stretched out hose that can be difficult to store or coil. Make sure that if you open up the nozzle after the hose has expanded, it is going to shrink as the pressure inside of the hose falls. If you happen to leave the hose, while full of water, in the sun or have higher water pressure, an expandable water hose may rupture because of the flexible and thin inner tube. While all that is true, there are many people who enjoy using expandable hoses because they are so lightweight. It is best to store them out of the sun and treat them with care. They often have plastic couplings that are crack-prone. However, some of the hoses come with brass couplings, which are more weather and use resistant. 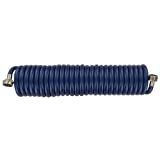 This is a quality expandable garden hose that is designed for use in lawns and gardens of all sizes. 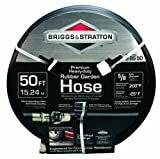 If you are looking for a durable, easy to use hose, then this is one you should consider. It is also more affordable than some of the other options available on the market today. A metal garden hose is a puncture and kink proof garden tool that is made out of industrial stainless steel. It is lightweight and available in 25 to 100-foot lengths. The hose is always cool to the touch and remains corrosion and UV resistant. Some of the most relevant problems with these hoses is rolling them up for storage. The metal makes them hard to store, which can be difficult for those who have limited space for garden tools. Also, compared to other hoses, these are much more expensive. The reason they have gained in popularity is their high durability. They can be used on virtually any terrain without worry of damage or other issues. This makes the higher price tag worth the investment. The most affordable metal garden hose you’ll find is the Gilmour Flexogen at 50′ length. It has a burst strength of 500 PSI, which is far more than you’ll ever subject this hose to. It’s made from a combination of an inner tube, foam, spiral-wrapped nylon, an inner core, more foam, and then an outer coating. You can’t ask for a better-constructed metal hose. A soaker hose is used most often for garden irrigation purposes. The best soaker hoses are made out of recycled plastics and rubber and feature porous walls. When you turn the water on, it will ooze through countless small holes present in the hose. This allows water to seep into the surrounding dirt. You can lay your soaker hose directly on the ground, but it is best to put it beneath a mulch layer. You can also bury it under the surface or six inches deep in vegetable beds. You will find soaker hoses offered in a number of lengths and diameters. The bigger hoses are often difficult to work with, and they aren’t flexible. You will have to use garden stakes to keep the hoses in place and it is best to lay the hose in the sun for a while to help and soften them before you use them in the garden. A soaker hose is the best option for areas that are level and short. If you are using a larger soaker hose, then you will need to make sure that you have sufficient water pressure to make sure that the water is seeping out the whole length of the hose you have used. Crafted out of recycled material, this hose features extra thick walls to reduce the potential of spurting, as well as nickel plated brass fittings. It is also sold with a lifetime guarantee. There are no attached couplings sold with this hose. When you purchase it, you can cut it to the length that you desire and then insert the friction fit, female and male fittings that are provided. Since the hose is sold with two of each end, you can cut the product into two different hoses if that is what you want to do. Designed to be a flat soaker hose, it is crafted out of mesh/woven material and sold with plastic couplings. 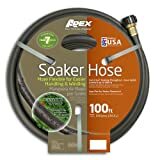 This is not a soaker hose that you would bury, but it is much more flexible than the rubber soakers and works with homes that have lower water pressure. The exterior of the hose is covered in fabric but made from a perforated PVC liner. This hose is ideal for homes that have lower water pressure that remain under 60 psi. It is very similar to the design and look of the hose mentioned above, the Melnor flat soaker. 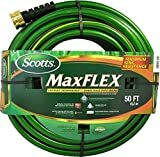 This soaker hose is unique to the other options available for sale today. It is crafted out of vinyl to provide exceptional flexibility. You can purchase this hose in several lengths, including 100 foot, 50 foot, 75 foot and 25 foot. This hose is also manufactured in the United States. These hoses are ½ inch and able to be customized to meet your unique irrigation needs. All you have to do is cut the pieces to the desired lengths and then connect. 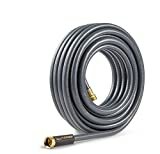 When you purchase this hose, you will receive 50 feet of ½ inch soaker hose, as well as 25 feet of ½ inch garden hose and one quick connect coupler, one faucet adapter an end cap and eight hose couplers. This hose is most commonly used as part of a larger drip irrigation system. It features ¼ inch porous tubing. 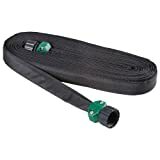 In order to use this hose, you will have to buy ¼ inch barbed fittings and make sure that you provide a water supply line that is ½ inch, or bigger. However, this is an efficient option for watering your lawn or garden and simple to get started with. If you have plans to drink out of your water hose, or if you let your pets do this, then you will need to make sure you choose one that doesn’t leach any harmful chemicals. The majority of garden hoses available on the market today are made with various materials, such as plasticizers. While these will provide a hose with flexibility, they also contain a number of chemicals, such as phthalates, lead, and BPA. These can get into the water inside the hose. Even though these chemicals are not going to harm your plants, they can be dangerous for humans and pets. To avoid these issues, look for the best hoses that have been labeled as being “drinking water safe.” At the very least, find a hose that is labeled as “lead-free.” In many cases, you can find these sold for recreational purposes, such as for use with RVs or boats. These types of hoses are considered non-toxic, and they have been FDA approved as having an inner core that will not leach any harmful chemicals. If you are looking for durability, then you will find this hose, which is 20 percent thicker than others on the market, delivers. This hose doesn’t leave any significant plastic taste in the water, which makes it great for drinking. It also features nickel-plated brass fittings, along with strain-relief ends, which provides even more durability to the hose. It is manufactured in the USA. Featuring collars and fittings on each end of the hose that are chrome-plated, this hose is durable and efficient. It can handle a flow rate of four to five gallons a minute and is sold in four different colors. Primarily designed for marine use, featuring fittings that are not going to deteriorate in salt water, you will also find this hose is great for smaller areas in your garden. Keep in mind; it will only stretch out to approximately 15 feet, so you need to purchase a longer option if you require additional reach. If you are interested in a great space saving option, then a coiled hose may be ideal. This type of hose will form into a tight spiral that will pull together when it isn’t being used. They are typically offered in much shorter lengths – between 15 and 25 feet – but there are some companies that offer longer options. Due to the coils, these types of hoses will not stretch out to their entire length. For example, if you purchase a 25-foot hose, you may only be able to extend it to about 15 to 20 feet. Make sure to consider this if you are planning on purchasing one. Additionally, storage of this type of hose can be difficult. You can store them on a reel, but if you put them in a storage bin or large pot, they can become tangled easily. There are also stand up hangers and wall mounted hangers that make hose storage a bit easier. It is best to use coiled hoses for watering and in small locations. You will find they are great options for a balcony or patio area where you need to store the hose out of the way. Now that you are familiar with the various types of hoses available, you may want to know more about each one and what products are recommended. Here you can find a few options for each type of water hose above to consider. Being informed is the best way to make an educated decision regarding the hose you ultimately purchase. Using this hose is easy thanks to the 12-inch section of straight hose that is provided at each end. It features a collar and brass fittings that are chrome plated and is considered drinking water safe. This hose can stretch to 40 feet and is manufactured in the USA. Offering solid brass compression couplings and coil spring hose protector, this hose also offers a faucet adapter. At its widest point, it measures 5/8th of an inch in diameter. It is somewhat of an oval in shape. This is extremely similar to the Water Right hose and provides safe drinking water. It features nickel-plated couplings and is made in the United States. It is crafted out of 50 percent all recycled materials. A quality garden hose is an asset for any home. You should compare the process of shopping for a garden hose to purchasing an extension cord. You always need to think about the length of the hose first. It is a good idea to measure the distance from you actual wall spigot to all of the places that you are going to need to use the hose. You also need to look at the thickness of the hose. If you are only going to use a hose every once in a while, then make sure to find one that is durable, but you don’t have to spend too much. With the information here, you are going to be able to find a quality hose that is going to meet your needs and watering goals. Keep in mind, if you are using a hose often or on rough terrain, find one that is more durable and offered with a warranty. This will be the best option for your yard and ensure that your hose lasts and works for as long as you need it to. Finding the right hose will pay off in the long run and be worth the investment. I have a hose seems to be reinforced rubber, internally has a star shaped rubber infill, colour is green with two thin orange stripes down the side. Could someone please inform me if in fact this is a garden hose and of what type. Also what type of hose attachments would I need.